In just under two weeks, 'Symphonicities', the highly-anticipated companion album to Sting's Symphonicity World Tour, will be released by Deutsche Grammophon. However, Sting fans in North America don't have to wait that long to hear what Sting has in store come July 13th. Starting today, if you live in North America and you pre-order 'Symphonicities' from the Sting Online Store, you will instantly receive a free download of the completely re-imagined version of "Englishman In New York" featured on the forthcoming album. When pre-ordering 'Symphonicities' from the Sting Online Store, Sting fans have a number of ways to buy. 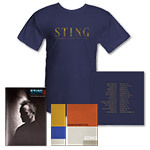 Along with purchasing the standalone album digitally or physically, fans are invited to purchase the album as a bundle, which includes the album in your choice of physical or digital format along with a new Sting North American Tour Itinerary t-shirt and program from the tour that inspired the album. Fans ordering the bundle enjoy a savings of more than 25% on their purchase. Pre-order Symphonicities, the ultimate commemoration of the Symphonicity live concert experience, today from the Sting Online Store and get your free download of "Englishman In New York" instantly, weeks before it's available anywhere else! Members anywhere can order the New Sting Symphonicity CD Bundle comprising the new Sting CD 'Symphonicities', navy Symphonicity 2010 Tour T-shirt and a Sting Symphonicity 2010 Tour Program, which saves over 25% when you purchase these three products together as a bundle! Visit sting.shop.livenation.com.